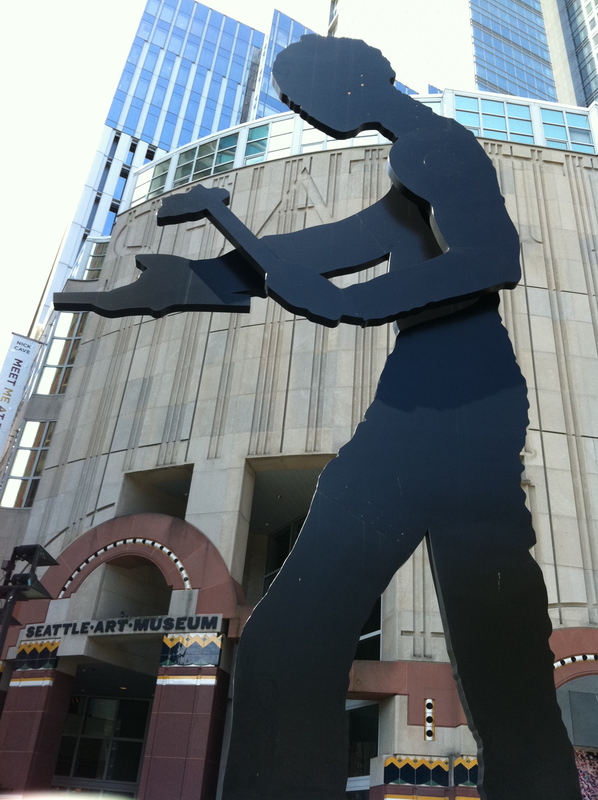 (If you’re interested you can find Seattle Adventures #1 #2 and #3 here). 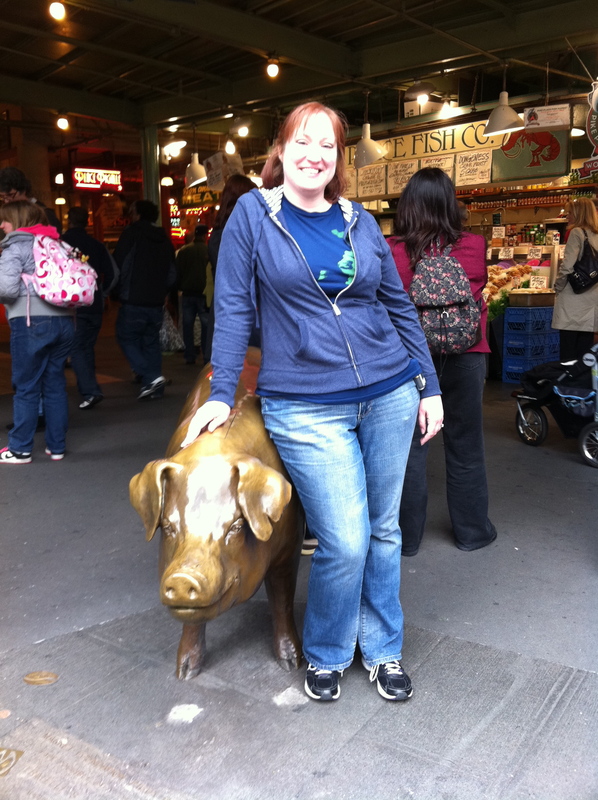 The topic of this last post about my Seattle trip has had the most significant impact on me. It’s rare that I (or any parent) gets time to just talk….to adults….without a time schedule, without kiddos around, without having to spell out words so the kids don’t know what you’re talking about. And I needed that. It was so good to be able to talk to friends. I was able to reconnect with a friend from college. He moved out to Seattle and lives right near my cousin. He and I haven’t talked in probably 10 years! But when we got together it was just like “old times”. He’s been through more in these 10 years than anyone should in a lifetime! We both shared our painful journeys, we cried with one another, we laughed with one another, we shared with one another. Then he did something that is still burned in my memory. And my cousin did this over the course of my trip too. We were sitting in the food court of a mall waiting for Sarah to get there and talking. I had just finished sharing about what has gone on in the last four years or so. He looked me in the eyes and spoke to me, but it felt like it hit so deep down into my soul. He said he was sorry for all that has happened. And he said that he wanted me to be happy and healthy. There was more to it, but that’s it in a nutshell. But the way he said it, looking right into my eyes….I don’t know. It was just so sincere, so genuine. It felt like it pierced me in a good way. Sarah did the same thing a few times! I don’t think we do that often enough. How many times do you look into someone’s eyes…I mean REALLY look into someone’s eyes and speak to them? Really speak to them. Share genuine, real feelings and words while looking into their eyes. I think we need to do that more. We need to look into each other’s eyes. And speak. And listen. Connect. I mean really....look at this! Who else could look so AWESOME in that hat? I could never pull it off! My cousin and I had some of the most amazing talks. Talking into the wee, wee hours of the morning a few times, but so amazing. I’ve always thought she was so perfect and I’ve never measured up to her. She is a world traveler, vegetarian, so healthy, gorgeous, wise, FUN, hip and cool, smart, successful, just so different than me. But through our talking I saw that we are not SO different. We both have issues. We both have things that are hard for us to live with, deal with, things to work on. And some of those issues are actually the same! I don’t feel like this “brought her down” in my view of her. I still think she is all of those things listed above. But now I can see that she is like me and we can journey through this stuff together. We can work though our issues together. I’m not alone in feeling this way. We can help and encourage each other. We got to talk about religion, God, our childhood, relationships, philosophy, nutrition, healing, massage (she just graduated and is interviewing for massage therapy jobs), personalities, our flaws, our “first born” tendencies…..you name it, we probably talked about it some point! I can’t remember the last time I was able to talk like that. And share questions. Questions that we were fed answers to as kids, but now that we’re “all grown up” (ya, right! ), we are questioning again. Those answers just don’t really hold water considering what we’ve experienced and learned in life. It was a little scary asking some of those questions. Questions about life, about the Bible, about God. But at the same time, is was so freeing. I wonder about things…a lot of things. And being able to put words to them was freeing. And then to hear someone else had the same questions….made me feel not so alone in my wonderings. And reminded me that it’s ok. It’s ok to wonder, to question, to seek answers even when they don’t come quickly or easily. It reminded me that God is big enough to handle my questions. He doesn’t’ get offended or scared or angry. And my questions actually can push me closer to Him. Because I want Him to give me the answers. I want to seek Him and seek the answers. And that is a journey. I may never get the neat little answers I seek. But I am on a journey to find them and that’s ok. And on that journey I am learning so much and I am getting closer to God, even if that means questioning Him and His Word sometimes. Because I’m trying to understand. And in order to learn and understand, you have to ask questions. 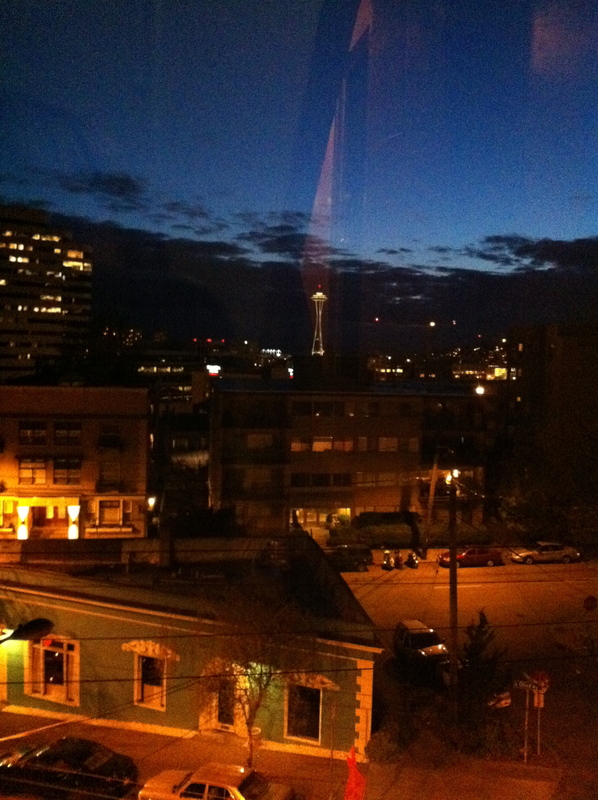 I am trying to recollect my amazing week in Seattle, and this is my third installment. Walking and Mountains and Nature are linked here. “Touristy” Things: I don’t travel much, but the few times I have, I try not to be too much of a tourist. I don’t know why, but I don’t want to be that geeky tourist. 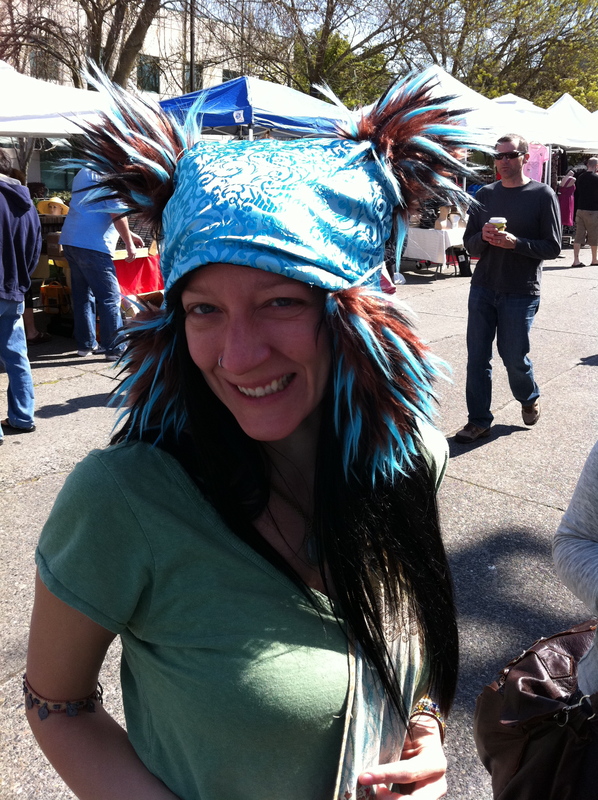 I want to blend in….even though I’m not from there. I know, I’m a dork, what can I say? For example, I refused to carry an umbrella in Seattle because only tourists use umbrellas. Those who live there are just used to it and pretty much don’t carry an umbrella. So, I got wet, my hair got a little messed up, but I didn’t look like a tourist! This is the view from the stairway in my cousin's apartment! 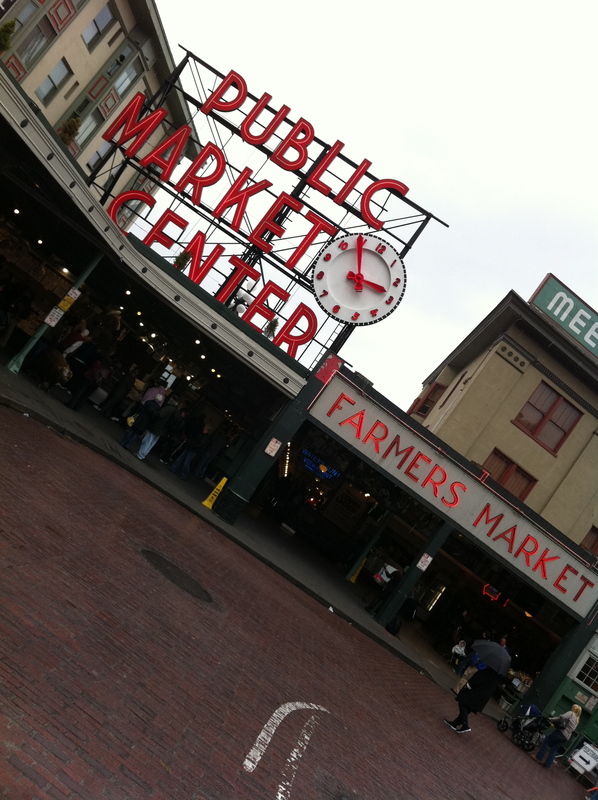 We went to the Pike Market. Oh my goodness…..beware!! You could spend A LOT of money here! There were SO many things I would have loved to buy for myself and for gifts! But we went there on my first day there, and I just couldn’t spend money shopping on my first day there. But there were beautiful artist’s pieces they were selling, awesome, quirky t-shirts I wanted, GORGEOUS tulips, fresh homemade yumminess, unique and interesting shops…so fun! So, I had to get the picture of the sign to show Caleb from his book. The funny thing is that the time on my picture is almost EXACTLY the same time as in the book! This pig was in his book, so I had to get a picture with him! I just thought this floor was so beautiful! 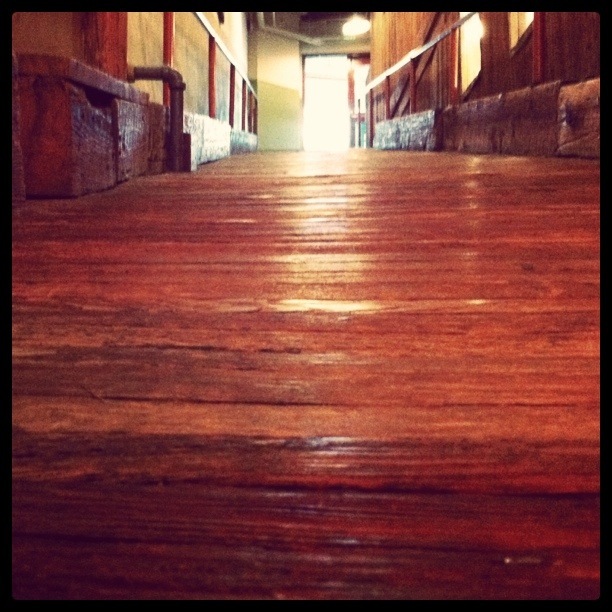 It is the original floor from the ramps they used to wheel the cargo to and from the boats. It was really wavy and lovely. I only had one quick second to put my camera on the floor and click this pic, but I like it. 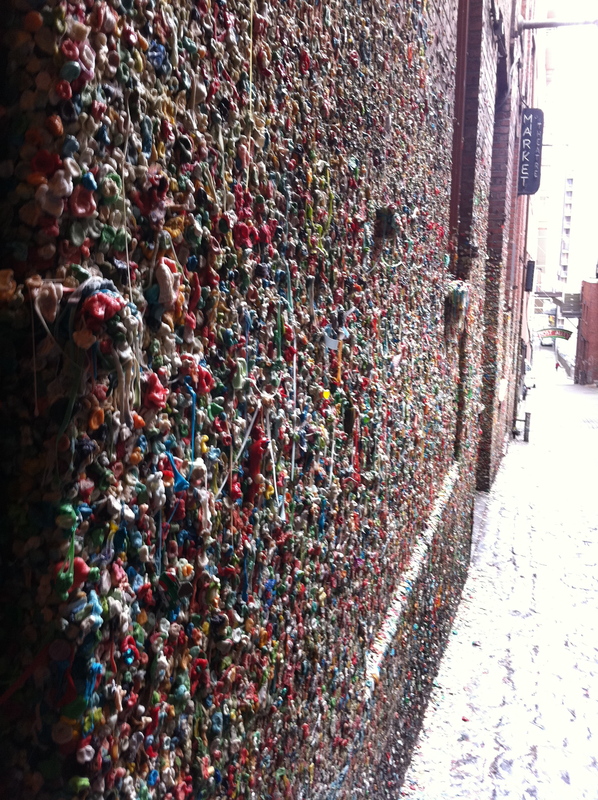 This is a wall of GUM! 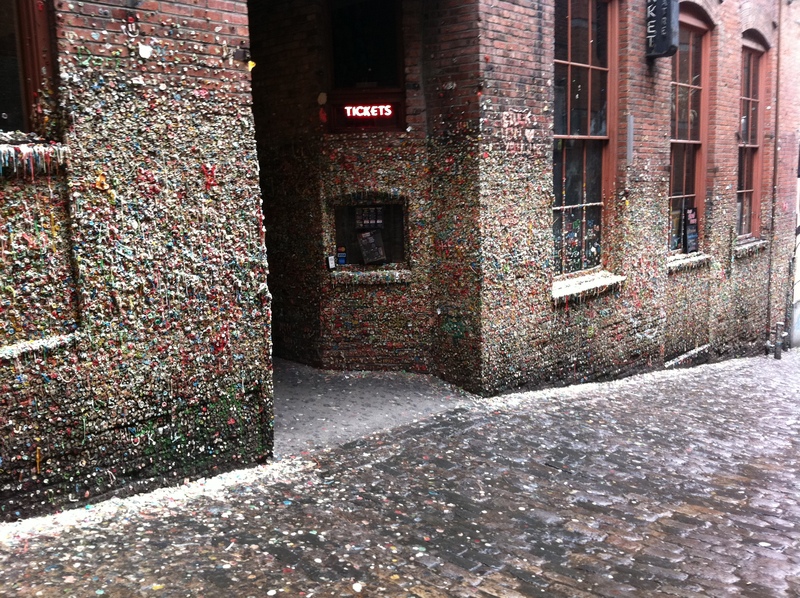 Chewed gum! Crazy, and kinda cool, and a lot gross! 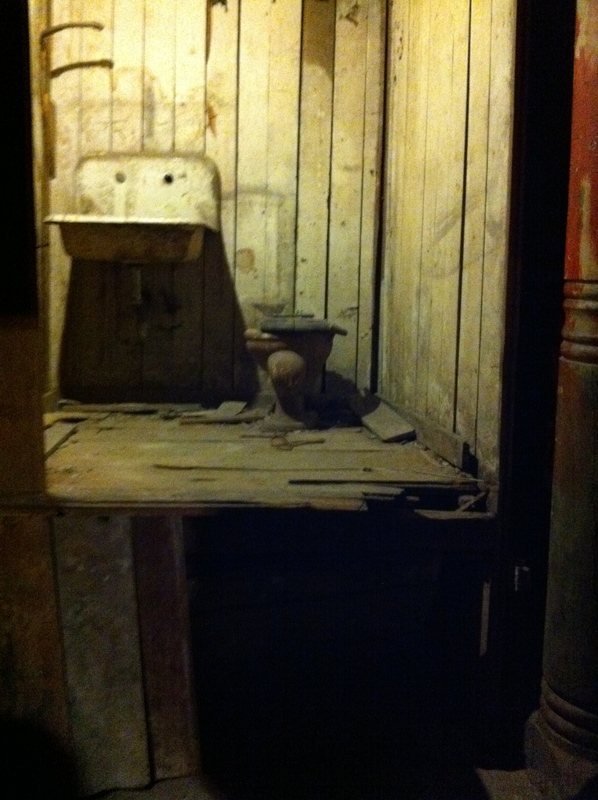 We did the Seattle Underground Tour and saw…. The first toilet! Named after its creator...Mr. Crapper! 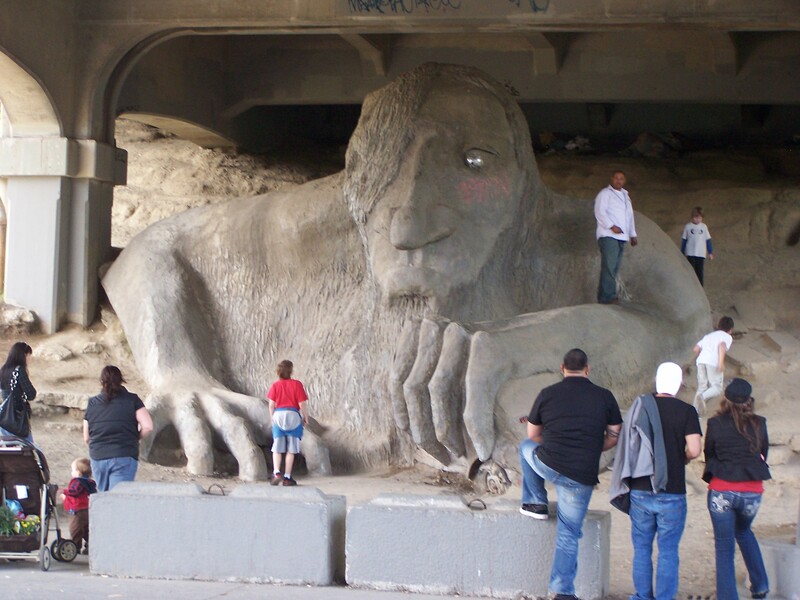 And of course you need to see the Freemont Troll! This thing is HUGE! It was an art project by some art students. The car in his hand is a VW Beetle. And he stays mostly free of graffiti! That was surprising to me. I like that they appreciate art enough to leave him alone. A pretty impressive sight. I chose the photo with people climbing on him to give you some perspective of his size. And, probably only a tourist would take a picture of the street…but the trees were so pretty! I really wanted to get some pictures of the cables above the street…but I would have to stand in the middle of an intersection and kinda thought that could be a little dangerous, so I decided against it. But I really wanted to! Mountains and Nature: I am so totally amazed, in awe at, just plain love seeing mountains! I guess living in the midwest my whole life hasn’t really afforded me much opportunity to see much terrain. I love the scenery! To me they are breathtaking. 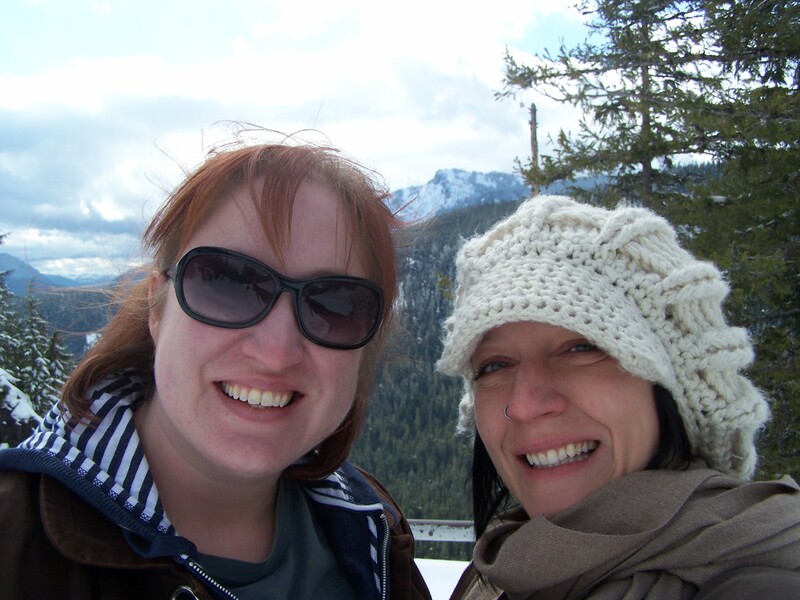 Sarah and I drove to Mt. Rainier one day. It takes about 2.5 hours to get there, then drive up the mountain to where you can stop and look out. I got horribly car sick on the way there….we almost didn’t go into the national park and up the mountain because the roads are just WINDY! And with being carsick Sarah was concerned I wouldn’t make it….and it ain’t cheap to get in the park. I am SO glad I made sure to go! It was incredibly cloudy, so we didn’t have much of a view that day, but still a wonderful time. The amount of snow (and therefore how COLD it was) was something neither of us were prepared for. 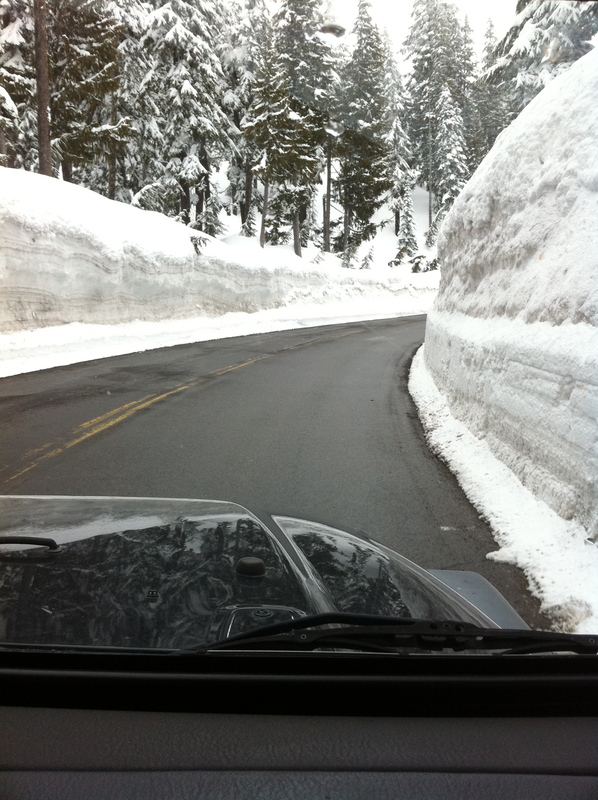 The people who run the snow plows there….there just aren’t words for how talented I believe they are! The roads are narrow and winding and narrow and winding and narrow and winding! There are poles stuck in the ground to let them know where to plow to and it is remarkable how close they get to those poles! We actually almost got run over by a snow plow. We were coming around a curve (did I mention the roads are windy?) and outta nowhere this huge orange snow plow is barreling down on us! We both literally screamed out loud a little! 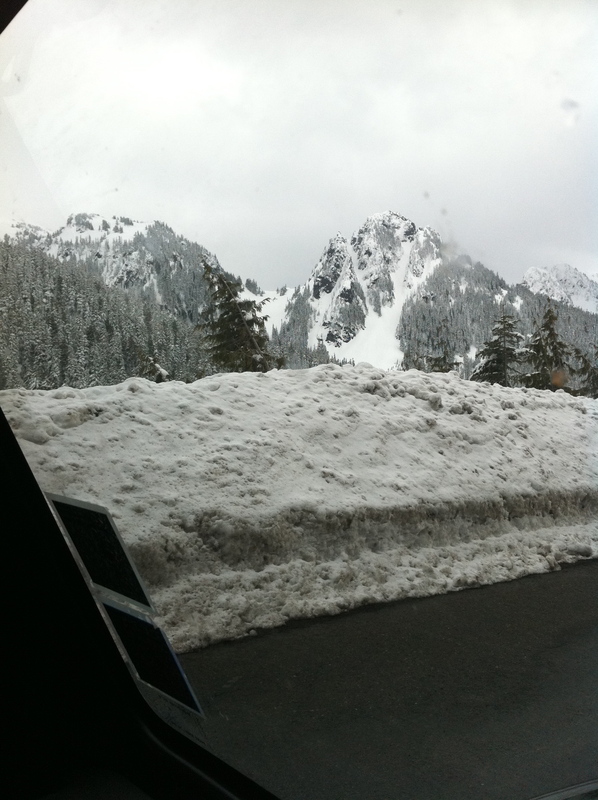 The snow was higher than our car as we drove up Mt. Rainier! 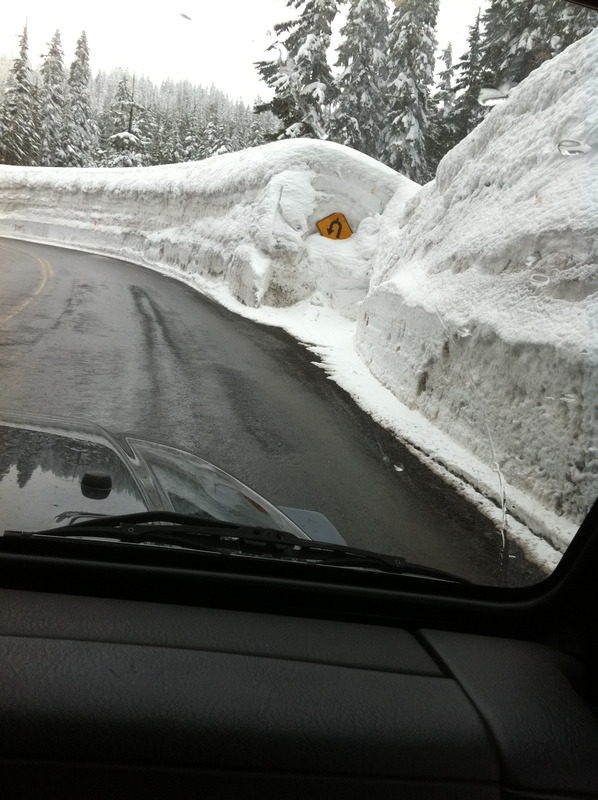 The road signs needed to be carved out of the snow! Once we got to the “top” (where you are allowed to go) we ate some DELICIOUS black bean salad and grapes for lunch. (Sarah has a couple recipes I need to get from this week!) It was FREEZING outside so we opted to enjoy the “scenery” from the car for a bit. 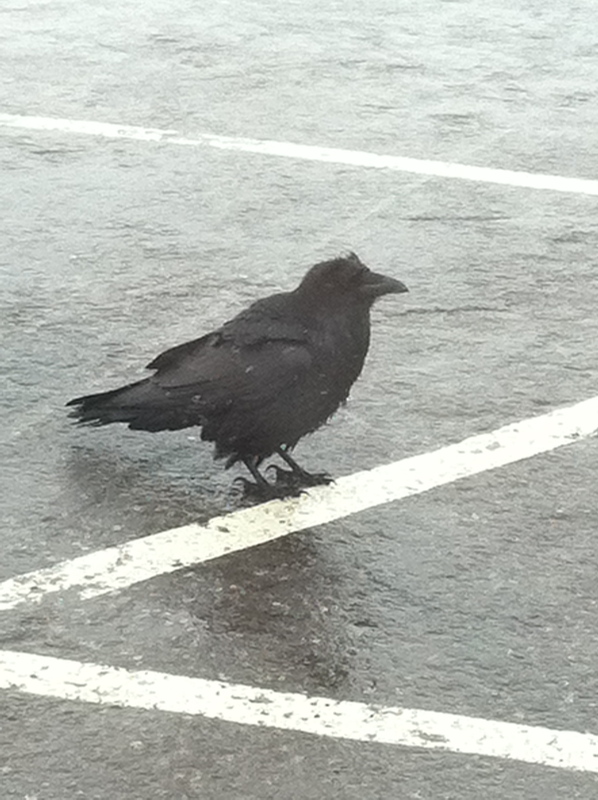 We saw this big, fat, gnarly looking black bird walking in the parking lot. We were astonished at how close he go to our car! But he didn’t fly, he was just this cute, fat little bird waddling around shaking his little tail feathers back and forth. He kinda looked like he owned the place and was just walking around to make sure all was well. 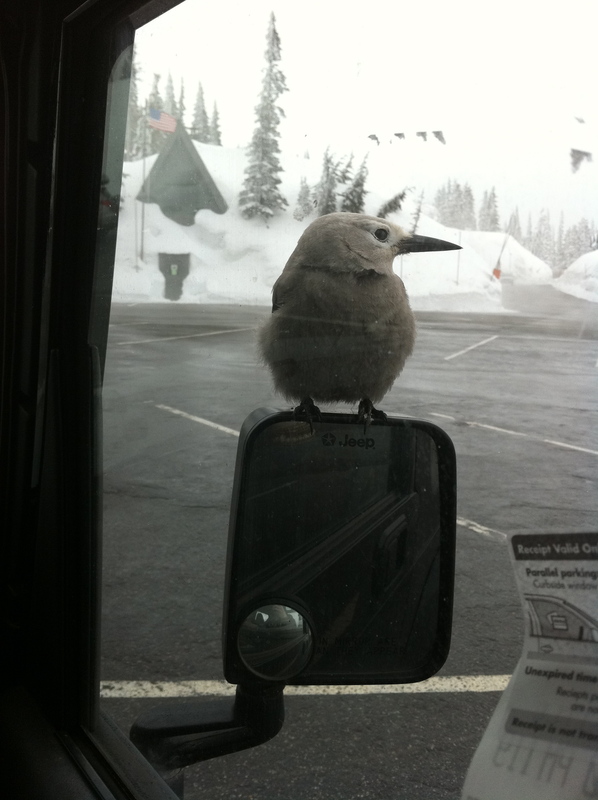 All of a sudden this little bird looks like it’s about to dive bomb our car, and instead perches on the side mirror! SO cute! Sarah and I were like little kids squealing at this little bird sitting SO close to us. 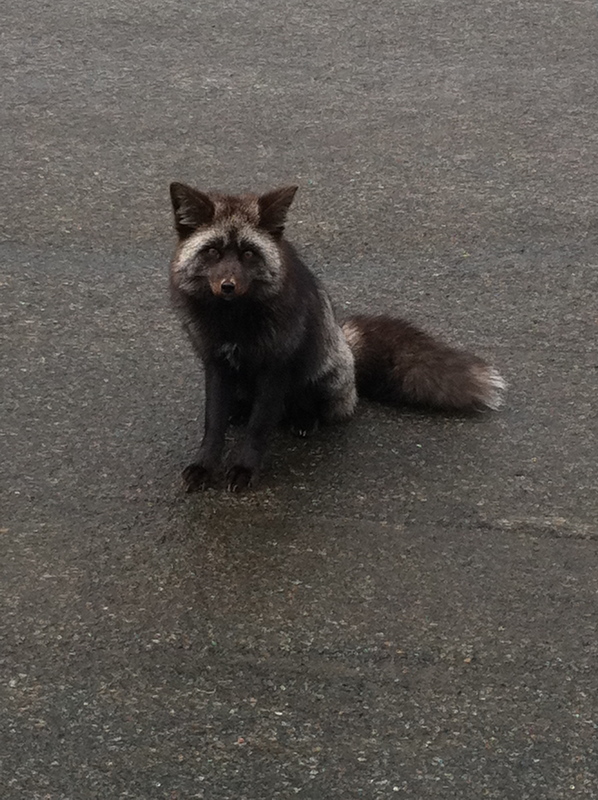 Then we saw one on another car in the parking lot. 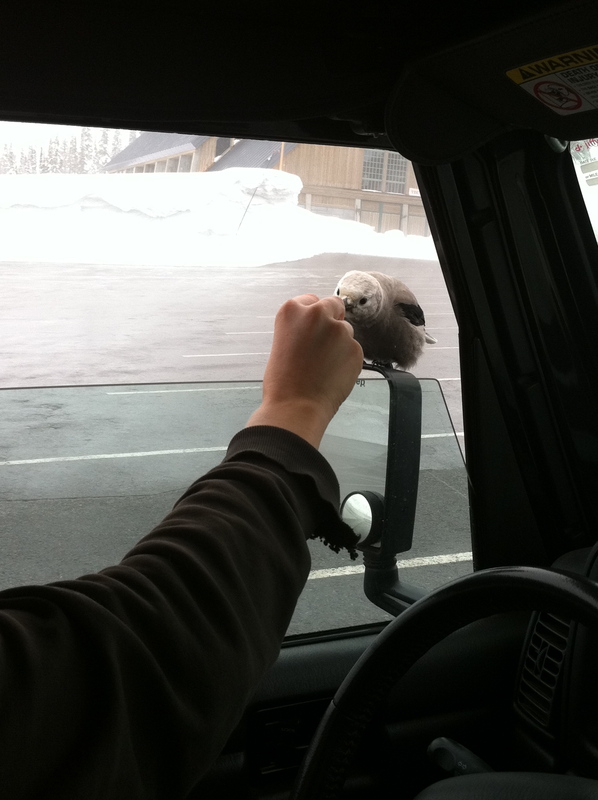 And they started FEEDING this bird from their car. Normally, Sarah and I would not have fed the bird….we didn’t know what if our food would cause him problems, etc. But we couldn’t resist! We broke off little pieces of our tortilla chips and fed them. 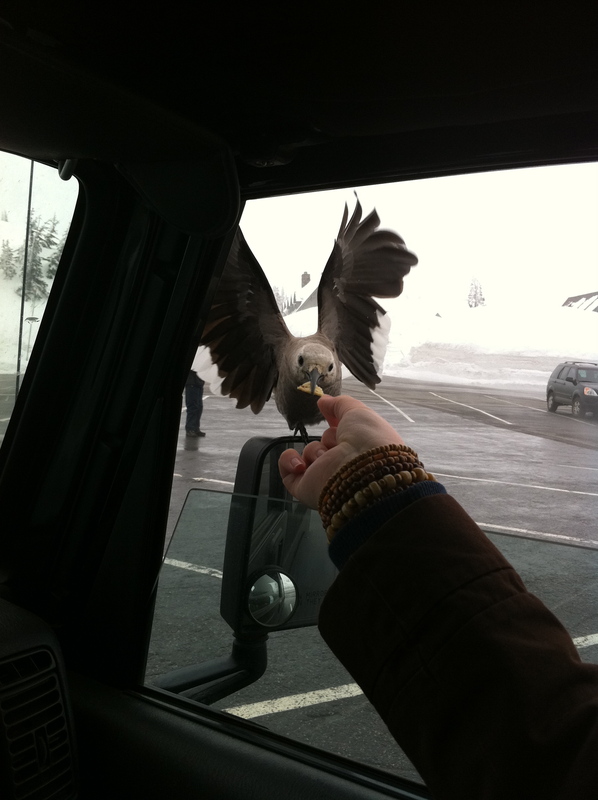 We rolled down the windows about half way and THEY ATE FROM OUR HANDS!! Again, we were like little kids! It was JUST like when Caleb gets so excited when the goats eat out of his hands. 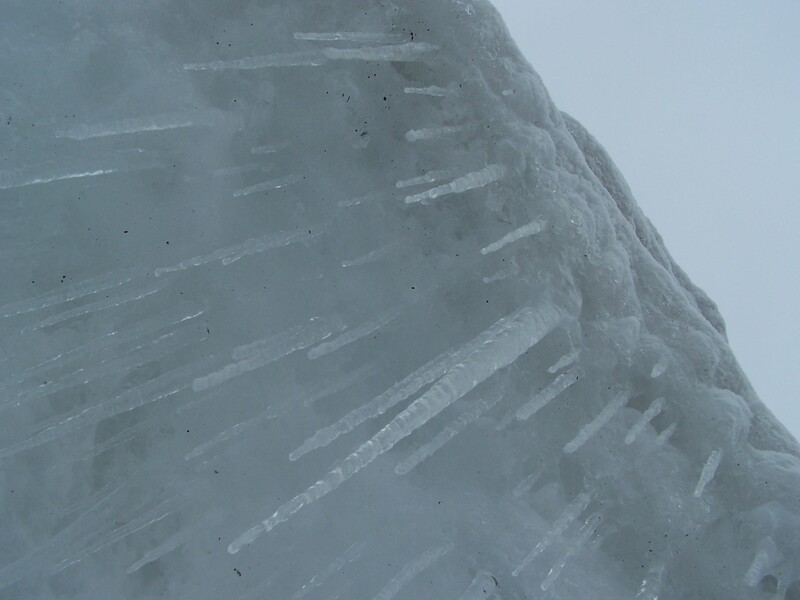 We got out and looked around a bit, saw some beautiful icicles, watched some people snowshoe…and that was about all we could handle of the cold. So, after freezing our hineys off, we started down the mountain. Along the way we stopped at another sort of look out point. 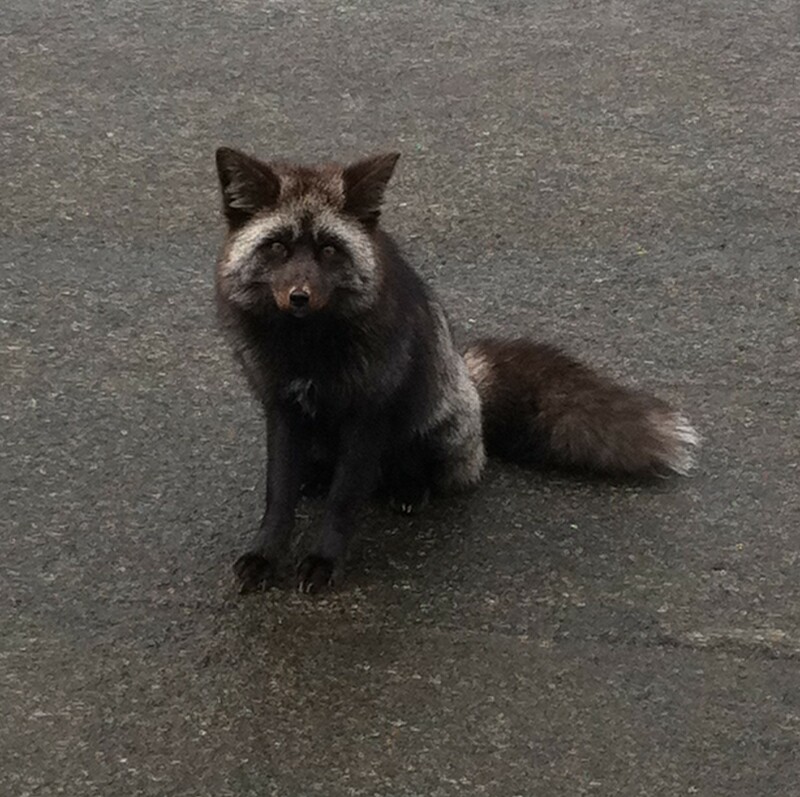 In this parking lot we met a FOX! He was SO cute!! Again, he was totally comfortable with people and came over to the car, circled it, checked us out, and we enjoyed our little companion for a bit. 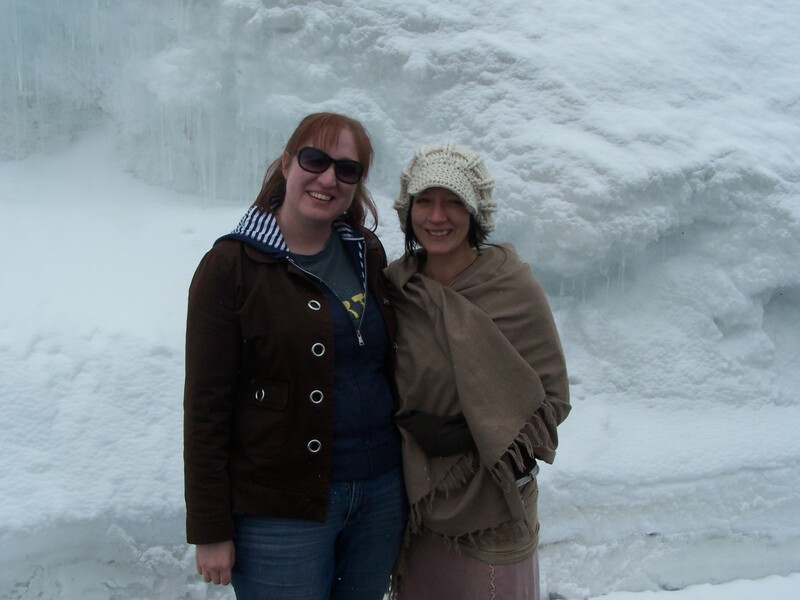 Sarah and I in front of tons of snow and ice! All of it was just beautiful! 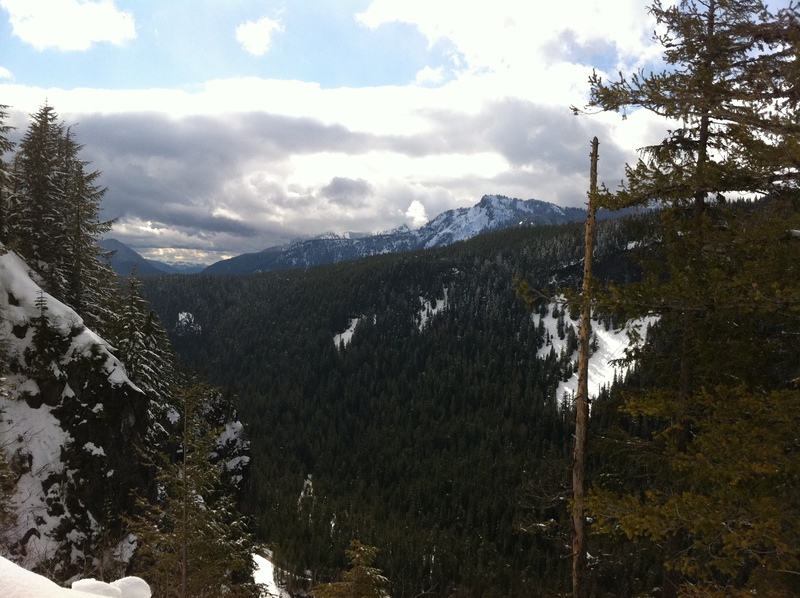 I LOVE getting out in nature….especially when it is out of the norm. I really feel like it’s a way that I worship. I just am in awe at God’s creation and the HUGENESS of God to see these things He created. I just love it so much! A BONUS! This is the top of Mt. 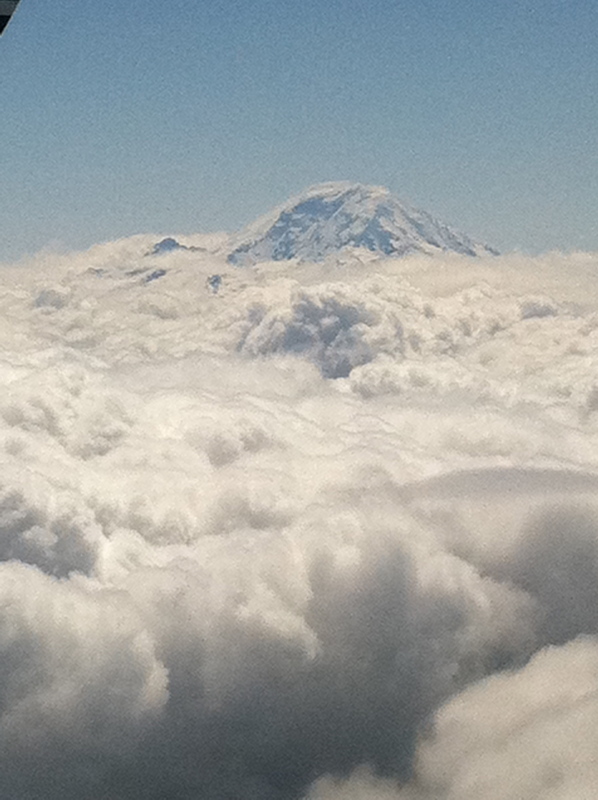 Rainier that I saw as I was flying out over the clouds! I was grinning ear to ear as I saw this amazing sight! I really wanted to “record” my trip to Seattle. For a few reasons, I want to remember it, and I’d love to share it with those of you who want to “come along with me”. I started writing a post and it was getting SOOOO long! I mean, really, how do you condense a whole week in a place you’ve never been into ONE post?!?!? 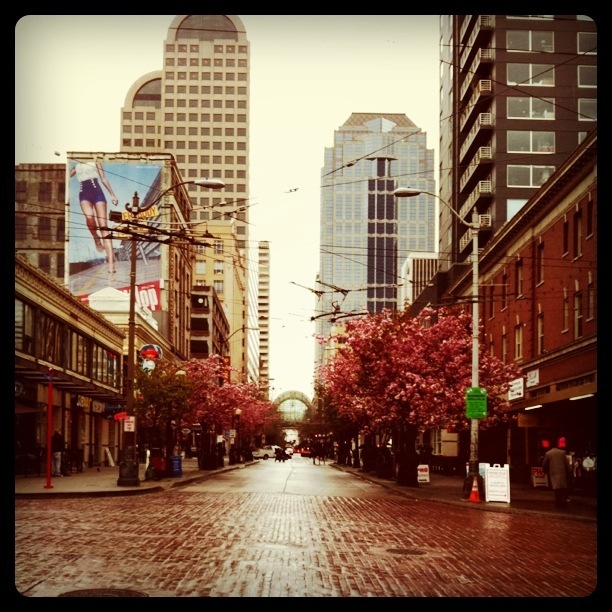 So, my first installment of Seattle Adventures….. Walking: I actually love walking. I don’t believe in running, but I like going for walks! One of the things I loved about Seattle (at least where my cousin lives) is that you can walk to SO many places. And you HAVE to!! Parking there gives me a headache and a stomach ache! And on top of that….I would ALWAYS lose my car, forgetting where I parked it! But that’s beside the point….back to walking…. Walking all over is awesome! You can see all the shops and stores, restaurants, unique and awesome people, people playing music everywhere….it’s pretty great in a lot of ways! And on top of it, great exercise! The drawbacks….HILLS!!!! Ridiculous HILLS EVERYWHERE!! I am SO out of shape. I knew that before going to Seattle, but Seattle just slapped it in my face everywhere I went! There were times it literally felt like you were climbing. 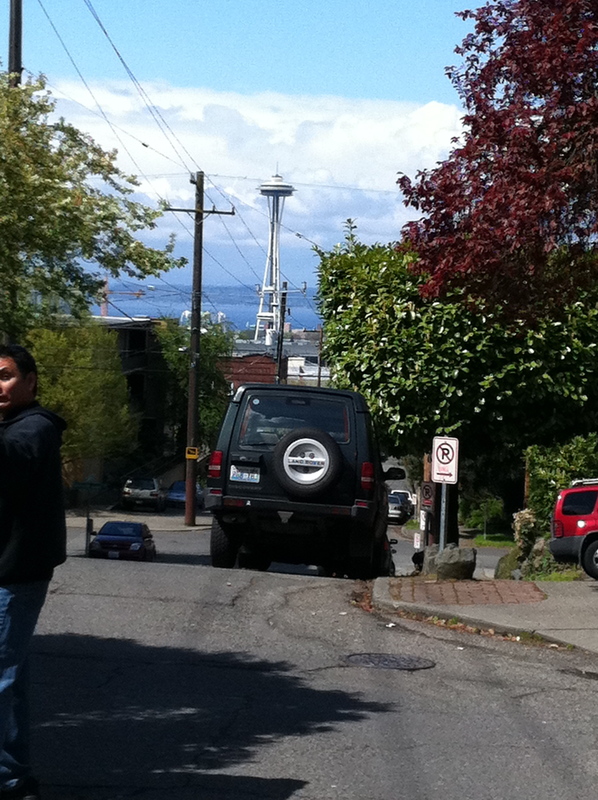 When someone in Seattle says, “it’s only about 10 blocks away”…BEWARE!! Those could literally be 10 blocks going straight up! There was one time we were walking down the sidewalk and this guy in front of us was smoking something and the big puffs of smoke were assaulting our faces behind him. It didn’t smell like a cigarette so I asked Sarah what that was – I was thinking it was a cigar or pipe or something. NOPE! Sheltered little Vicky didn’t know what pot smelled like! He was smoking a joint walking down the sidewalk! Apparently that is the least “bad” offense in Seattle. For example, smoking is not allowed in buildings or 25 feet from the front door. So, if two people are smoking near a door to an establishment and one of them is smoking a cigarette and one is smoking a joint, the cigarette smoker will get arrested first! That is just NOT what I am accustomed to!